I love that the nozzle fits under the toilet rim. Just squeeze around, leave for 10 minutes or so then come back for a quick scrub. Makes a horrible chore a bit easier. This is my favourite toilet cleaner. Sometimes I am lured to buy other brands when they are half price but i regret it every time. This toilet cleaner works great! Keeps the toilet sparkling and leaves a nice lemon scent that isn’t overpowering. It is my go to cleaner now. I’ve tried a few different toilet cleaners, but this one is the only one I’ve found that truly cleans and refreshes the toilet bowl. It smells fresh, without that overpowering bleach smell. It’s also easy to use. White King power clean toilet cleaner works to clean my toilet because of the bleach in it,it lifts stains easy and you are left with a clean toilet! This is a great toilet cleaner. It does a fantastic job of keeping our toilet clean and at its whitest. It is well priced and works very well. Will definitely use again in future. This is different to other bleaches as the thick gel formula will actually stick to the bowl for the 10 minutes you’re supposed to leave it prior to rinsing to kill all the germs. The shape of the bottle makes it easy to get the gel into hard to reach places. 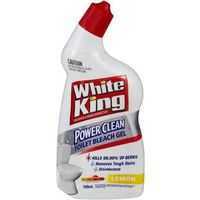 How would you rate White King Power Clean Toilet Cleaner Bleach Gel Lemon?